This month we see a sergeant posing for a photograph, probably before heading to France. We don’t know who he is but interestingly his lapel badges are the maple leaf of Canada and, zooming in on his cap (see lower left) the badge seems to match that of the Canadian Forestry Battalion. 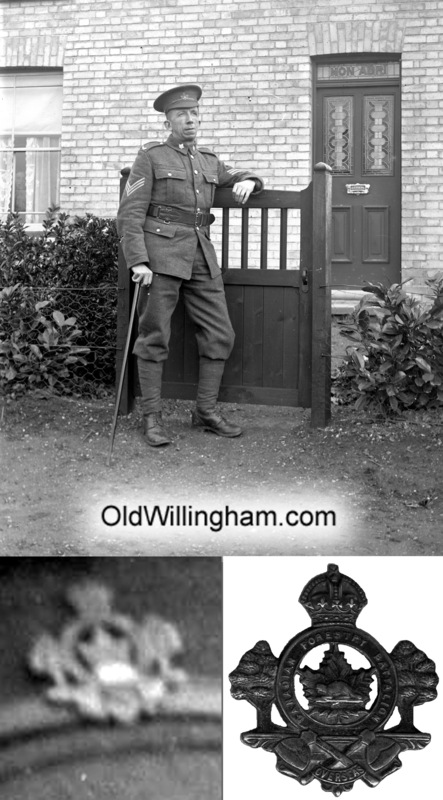 Perhaps he was a friend of Frederick Gadsby who was born in Willingham, moved to Canada in 1903 aged 19 and then volunteered to fight in the war . Perhaps Frederick and his friend were making a last visit before going to fight. Frederick was killed in action on 27th Sept 1918, just weeks before the end of the war. The picture is taken at the gate of “Mon Abri” a house that still stands at the bottom of Fen End.